Truck operators have begun their two-day nationwide strike to protest against the Goods and Services Tax or GST, diesel price hike and corruption on roads. 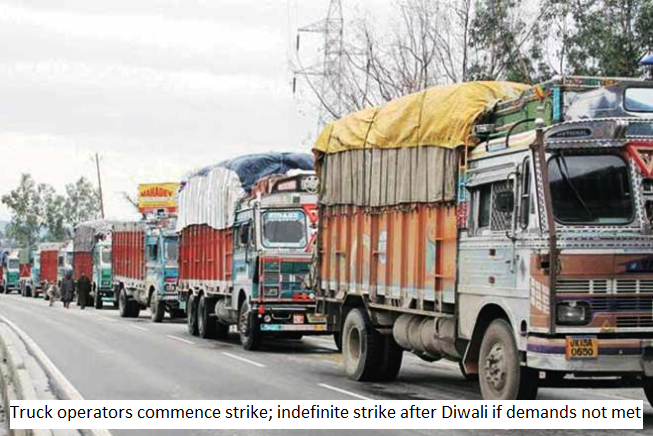 The countrywide protests have been organised by truckers' association All India Motor Transport Congress (AIMTC). Calling for a 36-hour nationwide strike starting from October nine, truck owners and operators are protesting "disruptive policies" under the GST and are demanding the inclusion of diesel in the new indirect tax (GST) ambit. Transporters have decided to protest against the callous and indifferent attitude of government officials, GST, diesel price hike and corruption on roads by observing a token 'chakka jam' (strike) on October 9 and 10, AIMTC president SK Mittal told reporters ahead of the strike. AIMTC, the top body of transporters, represents around 93 lakh truckers and around 50 lakhs bus and tourist operators across India. Supplies of commodities including food are likely to be affected during the peak of the festival season due to the token strike. Mr Mittal said that "contra laws" in the present GST regime has led to coercive registration and unnecessary compliance by truckers and transporters. The sale of used business attracts GST, which leads to double taxation by the government, he added. Another transporters body - the All India Transporters Welfare Association or AITWA - said that it will support AIMTC's nationwide strike claiming that the government has failed to give any clarification on national sales tax GST to transporters. "The strike call is given by All India Motor Transport Congress and we are supporting them," AITWA president Pradeep Singhal said, adding that "They (government officials) do not want us to understand the GST, they do not want to explain the GST to us, they do not want to give any clarification... and they are making it extremely complicated," he alleged. Another reason for the strike is the spiraling price for diesel. Stating that the exorbitant rise in diesel prices and daily changes in fuel rates have adversely affected the sector, AIMTC said that the government should revise the prices of diesel on quarterly basis instead of a daily basis. Mr Singhal also appealed to the government to make diesel prices uniform across the country and be brought down to the level of global prices. "Diesel and tolls account for more than 70 per cent of the operating cost of trucks. Diesel must be brought under GST to ensure uniformity of fuel pricing across the country," Calcutta Goods Transport Association (CGTA) president Prabhat Kumar Mittal said. When asked if it is wise to go for a token strike in the midst of the festival season, Mr Singhal said he believes that a token 'chakka jam' (strike) is a wise move at the time, and threatened to go on an indefinite strike after Diwali. "It is a suicidal move (strike during festive season). We are making a loss to ourself when we stop our vehicles on the road (hence a 2-day strike for the time being). After Deepavali when the festive season is over, we are going to go on an indefinite strike if the government does not listen and cooperate."